Mico Wave is the stage name for Michael K. Lane. In 1987 he teamed up with alums from George Clinton’s P-Funk to record an album that was released under the title ‘Cookin’ From The Inside Out’. Pitching in to provide production work and play instruments on the recording were Bootsy Collins, Catfish Collins, Bernie Worrell and Maceo Parker. 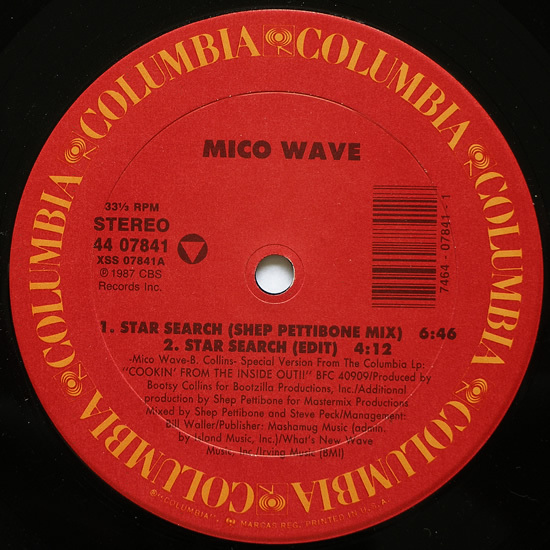 The third single released from the album was “Star Search” and was released on a Columbia US 12″ single only, remix duties performed by Shep Pettibone.